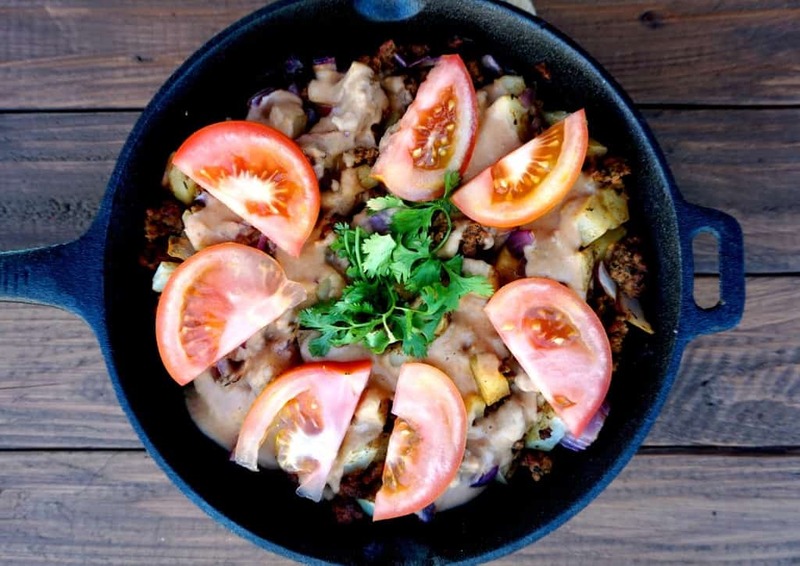 Sweet meets spicy as the flavor fusion from maple syrup and jalapeno powder unite to form a twist on the traditional breakfast potato skillet with a gluten free pinto bean gravy… You don’t want to miss this! I have to admit, I’ve never been to San Antonio. Well, not yet at least (I have high hopes of getting there next year when my sister moves!). Until then, I’ve decided to explore the flavor of the region through experimenting in the Shaw kitchen. Thanks to the wonderful Google machine, I did a little research and found that the staples of this area are heavily influenced around Tex-Mex flavor, focusing on tacos, burritos, chili and fajitas as more traditional dishes. Being a spice addict, I knew I’d have no problem using jalapeno, paprika and smoked chipotle to bring home that Tex-Mex flavor. Since I am going to bet nearly EVERY one of you has had one if not all of the classic Tex-Mex dishes listed above, I decided to put my thinking cap on and go out on a limb with this one. 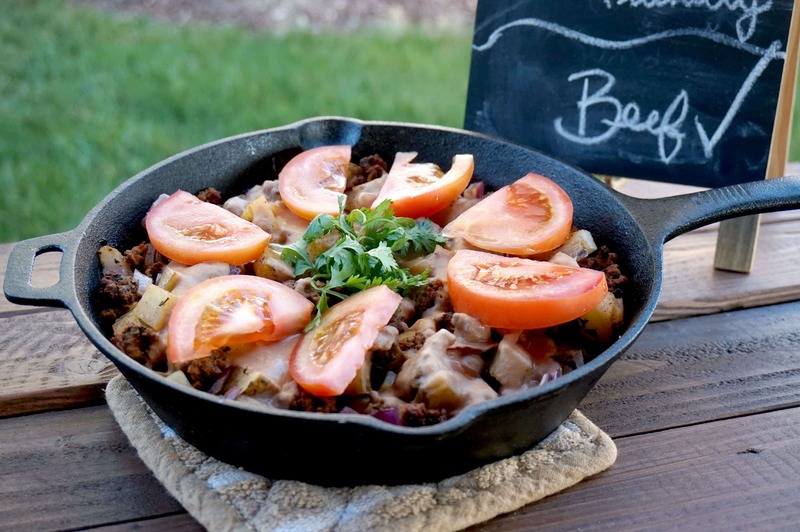 Enter… the Gluten Free San Antonio Breakfast Skillet! This is not your ordinary skillet. Sure, you’ll see southwestern skillets on restaurant menus that are infused with chorizo, cheese and a blend of sauces that are delicious but not so nutritious. This new original recipe is totally UNIQUE. Why? Well, I used lean ground beef as the protein base. I know a lot of people who can’t tolerate or just really don’t care for eggs. To appease them I decided to create a breakfast option that was lean, protein packed and super flavorful sans eggs. A 93% lean ground beef provides over 23 grams of protein for under 150 calories per 3 oz serving, a total winner in my book. 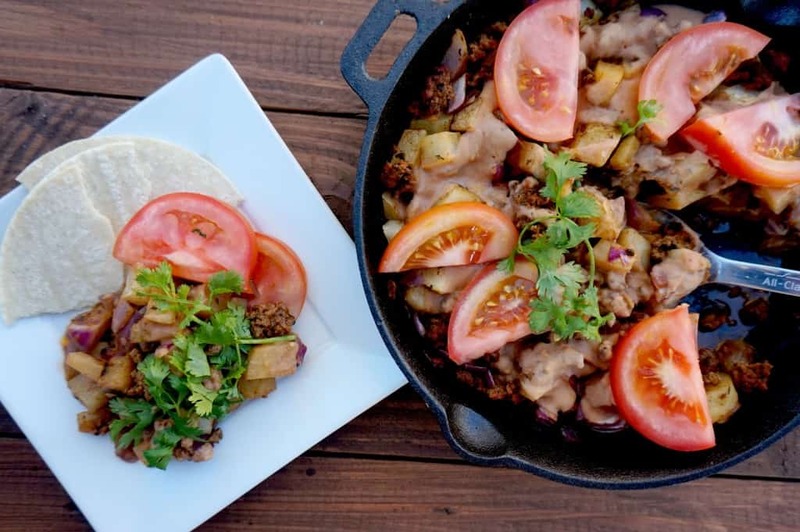 Plus, this Gluten Free San Antonio Breakfast Skillet has not only protein to help keep you feeling fuller for longer, its packed with fiber from vegetables and beans and carbohydrates from the potatoes to give you the complete package. I really went crazy when I concocted the pinto bean gravy- what you say, Pinto Bean Gravy? Yes, you heard me right! I wanted to create something that still tasted and smelt like breakfast, but was still fresh and remained gluten free. I took the pinto bean (something Google taught me is common in San Antonio Chili) and pureed it with maple syrup, smoked sea salt and tomatoes. Low and behold (I have to admit, I had NO IDEA how this would turn out), this literally swept Mr. CEO off his feet. Well ladies and gentlemen, case and point, we have a winner! I hope you enjoy as much as Mr. CEO did. Feel free to comment here or share your re-creation on social media using #shawsimpleswaps, I’d love to see what you come up with! In a medium nonstick pan, combined ground beef with 1/3 cup water and spices. Heat oven medium heat until beef is browned. Remove from heat. While beef is cooking, chop potato and onion into small pieces. 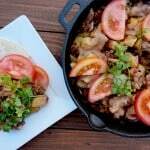 In a cast iron skillet, place 1 tablespoon olive oil with beef mixture. While cooking skillet, prepare gravy using a blender or blender cup. Add pinto beans with spices, tomato and syrup. Puree until smooth. Remove from oven after 30 minutes and top with gravy. Return to oven and reduce heat to 375*F for 5-10 more minutes. Remove from oven and top with sliced tomatoes and cilantro. 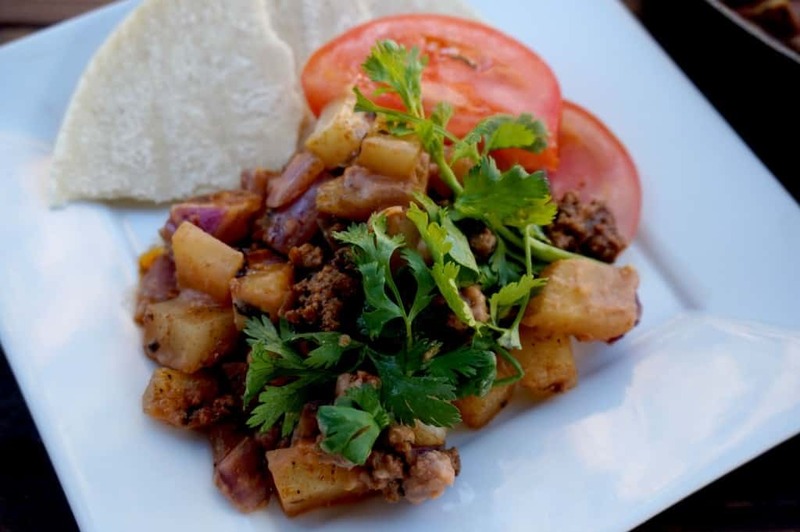 Enjoy with corn tortillas or cornbread on the side! Yum! Disclosure: I received beef product mentioned in this post at no cost. By posting this recipe I am entering into a contest sponsored by the Beef Checkoff and am eligible to win prizes associated with the contest. I was not compensated for my time. Wow, this looks intriguing. I’m going to have to try it this weekend. Can I find the special ingredients in a regular grocery store? Or do I need to check at Sprouts? We love filling breakfasts that do not include eggs. Thank you Liz! Absolutely! I am so glad you like it :)! Yes, all of these ingredients you should be able to pick up at your local market. You can always use a close alternative, like a regular maple syrup or lite syrup if you can’t find sugar free. Let me know how you like it! Your dish looks fantastic and I love the idea of pinto bean gravy. Will have to give it a try. Thanks! I hope you do, let me know how you like it! This would sure keep you going strong til lunch time – that pinot bean gravy sounds DIVINE. 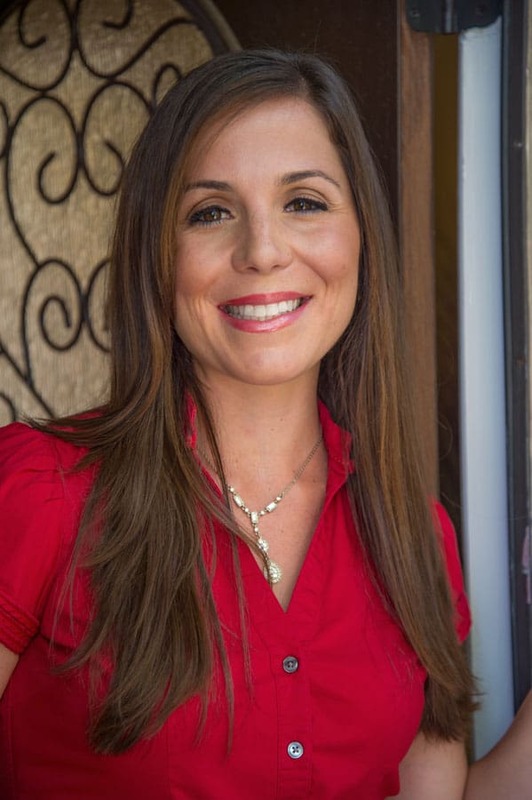 Thanks Deanna! I was totally skeptical at first… but low and behold, #Pintobean #gravy for the win! I LOVE IT! Mr. Spicy most definitely should… maybe an extra kick of jalapeno powder would seal the deal :)! I love your photos. Plus, the flavor combinations are right up my alley! Fun recipe! Good call making a bfast without eggs since not everyone eats them. I am from SA and my parents still live in the house I grew up in. It’s a great city with amazing restaurants! I would LOVE to go there! How fun- I love hearing those kinds of stories. I bet your kids get a kick when you go back and see your old room and such! I used to love that when my parents would show us their childhood home! Melanie- when the stars align, don’t fight it! HA! I hope you enjoy!